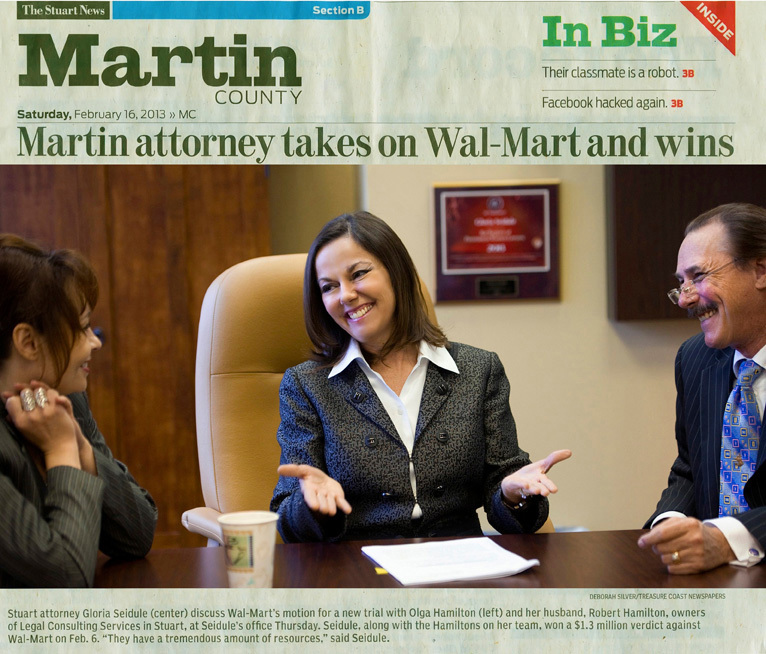 Stuart Personal Injury Attorney Gloria Seidule won a $1,287,144 verdict against Wal-Mart in a negligent maintenance and assembly case on February 6, 2013. 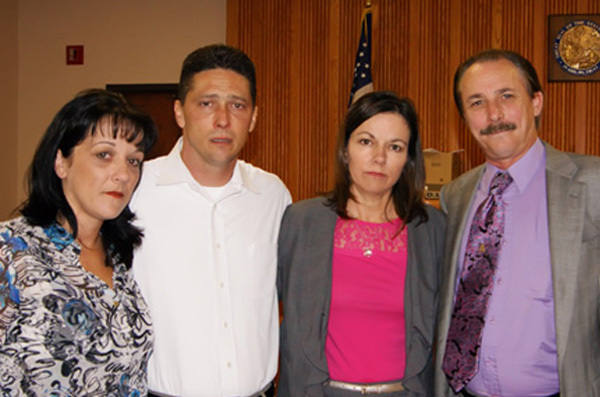 The verdict was awarded by an all female, St. Lucie County jury in front of Circuit Court Judge Dwight Geiger. After four hours of deliberation, the jury found Wal-Mart 90% at fault for the severe injuries of its customer. 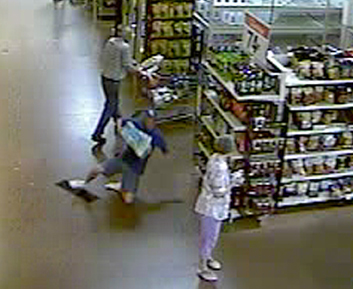 They determined that Wal-Mart negligently assembled and maintained a Gatorade sign that had fallen to the floor causing Tom Papakalodoukas, age 41, to violently fall to the ground tearing his biceps tendon in his right dominant arm. The evidence showed Wal-Mart discarded the display sign after the fall even though it knew from store surveillance the display was the reason the sign fell. Wal-Mart then defended the case claiming the display had been properly assembled and maintained. Wal-Mart blamed Gatorade for providing plastic screws that could have easily broken when attached to the sign display. Attorney Gloria Seidule countered Wal-Mart’s defense by presenting evidence, provided by the national Gatorade headquarters in Dallas, Texas, that if assembled properly, in accordance with Gatorade directions, the sign could not have fallen to the ground. If the screws had become broken or loose, it was Wal-Mart’s duty to maintain the sign to ensure the safety of their customers. Due to Wal-Mart’s failure to preserve the Gatorade display, the Court instructed the jury that it could infer negligence if it found the incident would not normally happen absent negligence and the display was in the exclusive control of Wal-Mart. 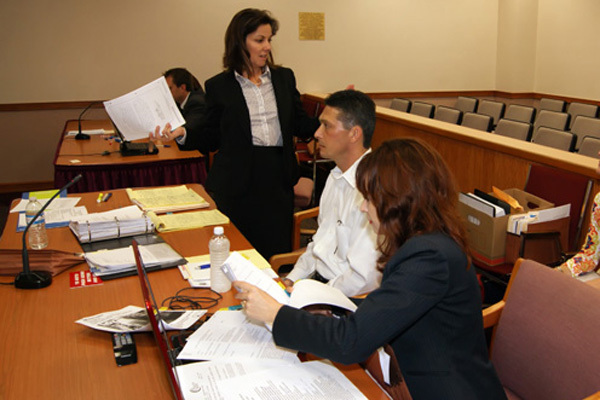 Robert W. Hamilton, Jr of Legal Consulting Services, Inc., provided Trial and Jury Consulting in collaboration with the professional skills of Olga Hamilton who orchestrated the trial production management during the proceedings. Copyright 2010-2020 by Legal Consulting Services, Inc. All rights reserved.